Selenite embodies a high vibration energy that works to help you to bring light down from the higher realms into the physical body, to create personal transformation. 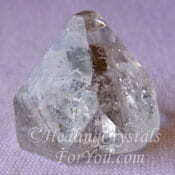 The white or transparent crystals have a strong vibration that may open the crown chakra and the soul star chakra. This will assist you to contact the Divine Mind and to access the Angelic realm. 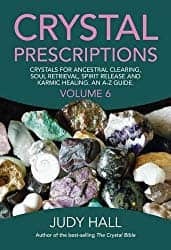 These are powerful high vibration healing crystals for you to use, that also deliver clarity of mind, by cleansing the aura of negative energy build up, both within the physical and the etheric body. 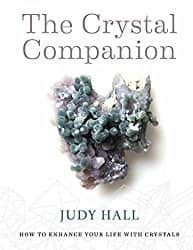 Learn to use these powerful healing crystals as they have a strong healing energy and are easy to use for this purpose. 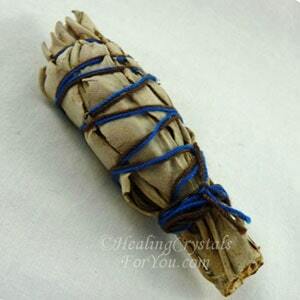 Read how to use wand shaped pieces for healing yourself and others. Selenite has been found in a large number of locations, including Mexico, Russia, Morocco, Greece, Poland, Germany, France, England, Australia and the USA. Its color may be pure white, transparent, orange, peach, grey-blue, green, brown and bright golden yellow, like the cluster shown in the image above. 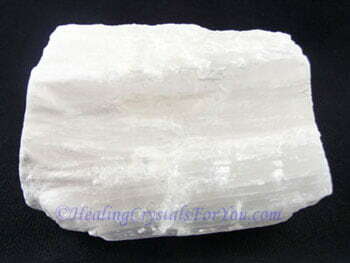 The meaning of the name Selenite comes from the Greek word meaning "moon". This related to the way that there was a reflection of color within the first stones being looked at, and this was the color of the moon. Beautiful white non-transparent Gypsum selenite crystals, as well as the partly transparent stones commonly come from Mexico. 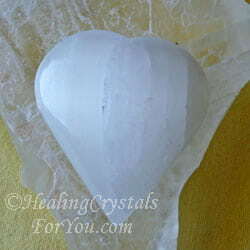 These are popular as they can be shaped into many uses for healing. Wonderful flat pieces of optical selenite can be easily bought, and many of these are made into long flat and rounded wands. A lovely but less common color is the Green Selenite, which is very unusual, and mainly comes from Australia. 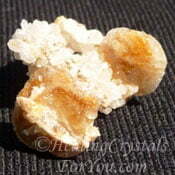 They occur as clusters of crystals and they are very fragile. They are fine needle-like green crystals, with some white and brown color towards the base of them. Another very beautiful formation that is becoming more sought after is the formation known as Fishtail Selenite or Angel Wing Selenite. 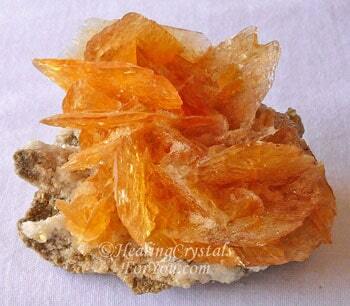 This formation and the beautiful Golden Selenite, are powerful crystals to use for metaphysical purposes. Golden Ray Selenite is another beautiful high vibration type that has come to light and is powerful to have in a healing environment. 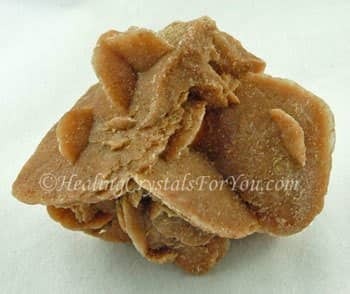 Desert Rose Selenite is a quite beautiful peachy brown rose shaped type that occurs naturally in Morocco. 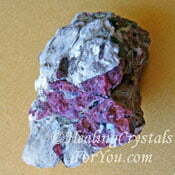 It is a very helpful stone to use to strengthen the power of positive affirmations. Why Would You Use Selenite? 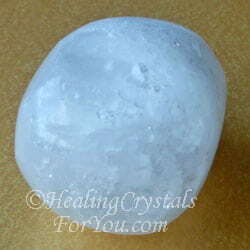 Selenite crystals are high vibration stones that will move your spiritual growth forward quickly. They are a stone of the third eye chakra, the crown chakra and the soul star chakra. Use this stone at the heart chakra or third eye first, and you may find that you will feel the energy moving through the crown chakra. Once it clears any negativity or distortions from the crown chakra, the energy is then free to flow via the stellar gateway to the soul star chakra. Many of you that have incarnated at this time have been spiritually active in past lives, and developed gifts and talents that your higher self still remembers. 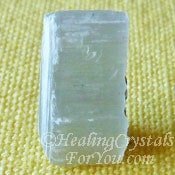 Using Selenite may help you to learn how to be psychic, as it has a strong vibration. 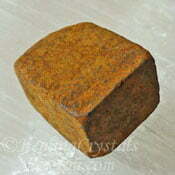 This stone may act as a conduit to other dimensions, as you remember your past lives in different places. 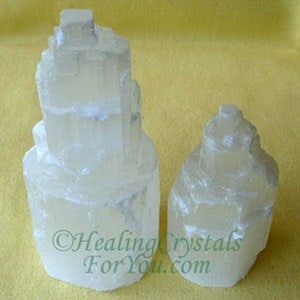 It is easy to buy Selenite Crystals yet many people who own pieces of this crystal have not used them. Once you make contact with the energy of your stone, you may find out the best way to use it, to benefit you personally. It is now coming to a time on this earth, as the vibration of the planet is rising, that many of you who own one of these, may wonder the best way to use it. Selenite crystals can be held at the heart as you are meditating, and this can be beneficial to help to relieve any stress or anxiety you may be feeling. 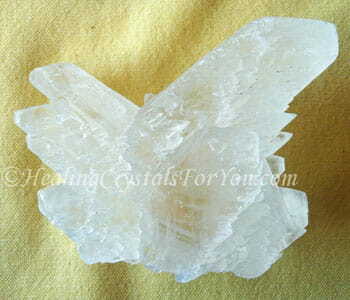 Using a piece of Fishtail Selenite like the one shown above, which is also known as Angel Wing Selenite, may help you. There are a number of reasons why the Angel Wing formation is very special. 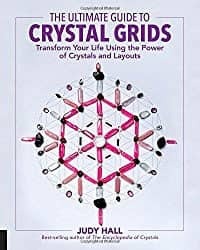 Using one of these might help you to begin connecting with angels, and they may also assist your psychic communication abilities. It can be beneficial to keep a piece on your body and Selenite crystals can also be used to grid the home to aid the removal of negativity. Just as long as you keep in mind that it should be kept dry. 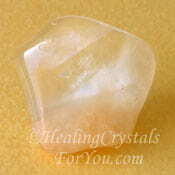 Begin by using a piece of Selenite in your daily meditation. You may choose to use them at the third eye chakra. The energy will move up to the crown chakra and the soul star chakra, and into the higher transpersonal chakras. These lovely crystals have many wonderful qualities, and are positive stones for opening up of gifts that you had not been aware of. As you use them to make contact with your guides and open yourself to spirit, many interesting possibilities may emerge. 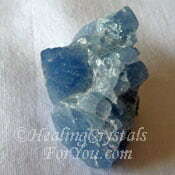 These crystals embody a helpful energy to relieve anxiety, and using this crystal instills deep peace. 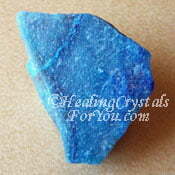 Using them can be very beneficial, as using one of these crystals is also one of the methods to relieve stress. Selenite crystals dissolve in water readily, so if you think about this fact, you may not be surprised to learn that they will aid the kidneys. This is one interesting area that they will help, but they may improve many other places in the body as well. 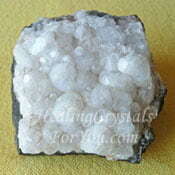 Overall they are positive stones, and may assist the movement of your spirituality and health in a positive direction. You may like to use a long flat selenite wand to create a multi-crystal wands, as this is one common way they are used. But the possibilities are many and varied. This will depend on exactly what healing outcome you desire to achieve. 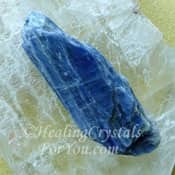 Using this crystal may allow you to gain access to your past memories and gifts, and make major changes in your current life, in line with your soul's purpose. 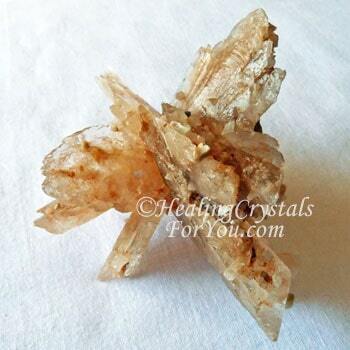 Selenite crystals can be made into beautiful wands like the lovely one in the photo below. They are wonderful healing tools. You can get wands that are made from the white Gypsum Selenite variety, which is known as satin spar. 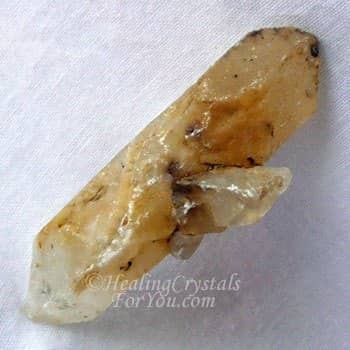 You can also use a natural Golden Selenite wand, as these occur naturally in a perfect shape to use for healing, see image of one below this. These lovely stones are very beautiful, and look quite different to the translucent variety, which is often called Optical Selenite. Satin spar Selenite may have vertical lines running down the length of the stone, and this is usually in the direction of the point of the wand. 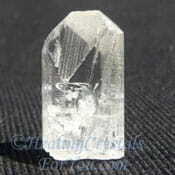 Crystals shaped like this may be referred to as light wands, as these wands are quite reflective of light. They make marvelous healing tools, as they will channel energy through them, and this energy can be directed by the healer. Wonder How To Use Selenite Light Wands? Want to learn about using Selenite wands for healing? 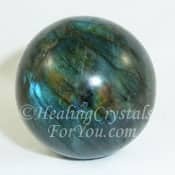 When you hold a piece of this stone in your hand, particularly a wand shaped piece, you should be able to quite quickly feel the energy within it. So how do you use them for healing, you may wonder? 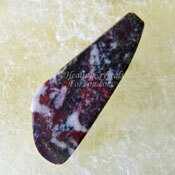 If you have a wand shaped piece of this stone, you can gently squeeze it to activate it. Then hold it to any area of the body where you feel you might need help. A healer, or anyone who wishes to use them for healing, can also use them to sense where the health problem is located in the body. This is useful if you are unsure of exactly where in the body the problem originates. The way that you discover where the problem might be, is by gently squeezing the wand and moving it. When you recognize that you are feeling a change in the energy flow, this tells you that the energy in this area is not flowing as it should be. The healer, or anyone using it for this purpose, would also activate the wand to use it for healing, by gently squeezing it. You then point the wand towards the specific problem area that you have become aware of, when you previously used it to locate the health issue. The vibration of these wands is powerful, as once activated they will cleanse the etheric field of the body of any negativity. The vibration of Selenite crystals, regardless of the shape it occurs in, often sets in train the birth of the psychic power of mental telepathy. This may be helpful for healers, to aid them to discover what a client may be needing help with, or just generally in your life to boost communication with that special someone. 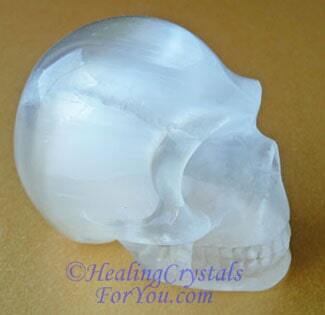 Using one of the crystal skulls made from this gorgeous white stone is very powerful. They may help you to make connections with specific spirit guides that are waiting to work with you, via the energy of the skull formation. 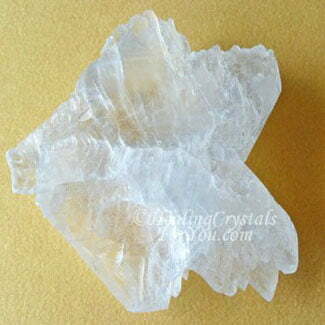 They are on the zodiac birthstone list, and Selenite crystals are easy to buy. It is possible to obtain these lovely stones in a variety of different formations quite easily. These crystals are often very beautiful, so it is common for people to be drawn to one of these stones, and have no idea why. Contact with water is not recommended for any variety of Selenite. 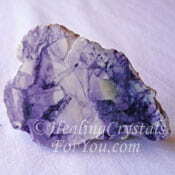 When cleansing these stones, use other methods of cleansing your crystals. Note: DO NOT WET your Selenite Crystals, as they may dissolve in water. Alternatively they may not actually dissolve but may discolor or pit. This may vary according to the specific variety. Even sealed pieces that have been fashioned into pendants or made into hearts or other shapes may lose their lovely sheen. In some cases, depending on the type, thin slices may come away. I had that happen when I spilled something onto a slab of this stone that I use as a background when taking photos, when I gently rinsed it off. Although it is important to cleanse crystals regularly, Selenite is a stone that you need to take a degree of care with when cleansing it. "In seeking wisdom thou art wise. In imagining that thou hast attained it, thou art a fool." The Talmud. If you want your spiritual path to accelerate, use this stone in combination with other sixth, seventh or eighth chakra stones or crystals. By the use of regular daily meditations you can expect to move your spiritual growth forward quite quickly. There are many stones that are common to all three higher chakra groups, and combined with Selenite they make a powerful meditation experience. Some specific ones that you might consider would be Herderite, Danburite, Tiffany Stone aka Bertrandite, Moldavite, Datolite, Natrolite, Yttrium Fluorite, Phenacite, Pink Petalite and Clear Quartz Crystals. Meditation with Selenite is recommended, either alone or you can combine it with any of these stones. This may open and activate the soul star chakra via the crown chakra. The soul star chakra is sometimes called the Seat of the Soul. 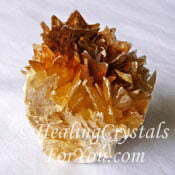 These lovely crystals are among the group of powerful high crystal energy stones. To decide which of the stones to combine with it, you may choose to read the articles on each of the high vibration stones, as they may have quite different outcomes. 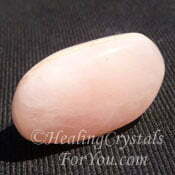 Pink Petalite is one of my favorites to use to get started with. Using this may take you to the higher realms to contact angelic beings, who may aid your search for enlightenment. 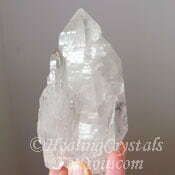 Clear Apophyllite and Angel Phantom Quartz aka Amphibole Quartz crystals are also good to combine with Selenite to aid contact with angels. Beautiful crystal jewelry made from any of the high vibration stones may move you forward more quickly on your personal journey. Use these while doing a meditation to boost psychic abilities, as any of these crystals also have the potential to develop psychic abilities. The development of telepathy, clairaudience and clairvoyance, or having psychic visions is possible once you begin to use the high vibration stones like Selenite. 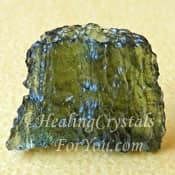 If you'd like to boost the possibility of developing telepathic gifts, you may like to combine this crystal with stones that help you to develop this capacity. This includes stones such as Petalite, Apophyllite, Phenacite, Natrolite, Muscovite, Ulexite, Labradorite Crystal, Eudialyte, Blue Kyanite and Blue Calcite.